kt literary » Blog Archive » SOLD! Congratulations to Michelle Ruiz Keil! SOLD! Congratulations to Michelle Ruiz Keil! 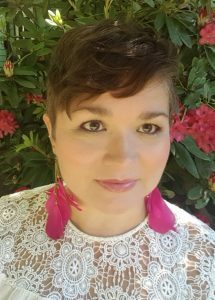 Amara Hoshijo at Soho Teen has bought Latinx author Michelle Ruiz Keil‘s debut novel, All of Us with Wings, a YA fantasy imbued with elements of Aztec mythology. The book follows Xochi, a teenage governess living with her young ward Pallas’s glamorous rockstar family in San Francisco. When Xochi and Pallas perform a cathartic punk-rock ritual on the Equinox, they accidentally summon a pair of ancient creatures determined to avenge transgressions from Xochi’s troubled past. Publication is set for summer 2019; Hannah Fergesen at KT Literary brokered the deal for world English rights. I met took on Michelle’s incredible contemporary fantasy last year and immediately fell in love with her lush characters, magic, and world. This book will break your heart and patch it back together again, and I can’t wait for you to read it! ← Happy Book Birthday to HOW I RESIST! !